As a part of an ongoing series, we’re looking at artisanal crafts that are regaining traction in the New York scene. This week, discover the origins of modern calligraphy and how it has been reinvented in the current marketplace. Derived from the Greek words for “beauty” (kallos) and “to write” (graphein), calligraphy literally means “the art of beautiful handwriting.” And what a rich history this art has. In the Middle East and Eastern Asia, calligraphy, like painting and sculpture, has seemingly always held a place of esteem within the world of fine arts. In the West, however, the practice of calligraphy developed much later — closer to the 15th century. With the Latin alphabet taking the spotlight, calligraphy grew (relatively) less exclusive and, in the 16th through 18th centuries, writing and copybooks began to gain prominence. These publications taught readers how to create letters, how to choose appropriate paper, cut quills and create their own inks, and provided space to practice copying pre-designed letterforms for themselves. By the end of the 17th century, calligraphy-style handwriting was not only being taught to scholars, but to the newly-literate women who began finding power in running their husband’s businesses. The typewriter made its debut at the end of the 18th century and writing professions began their decline in visibility and prestige. Most European and burgeoning United States practitioners shifted focus away from artistic calligraphy and towards the idea of an easy-to-craft, easy-to-read handwriting.The true push and pull of man versus machine dates back to the 19th century at least — the point in which the first calligraphy revival has been noted. Throughout each of these revival periods, a new form of artistic lettering has been added to the overall mix, alongside the well-established Spencerian and Copperplate fonts. Now, in 2018, we’re witnessing a new emerging style. Called ‘modern calligraphy,’ this style of hand-crafted penmanship is unlike any that’s come before it — primarily because it refuses to follow the rules. 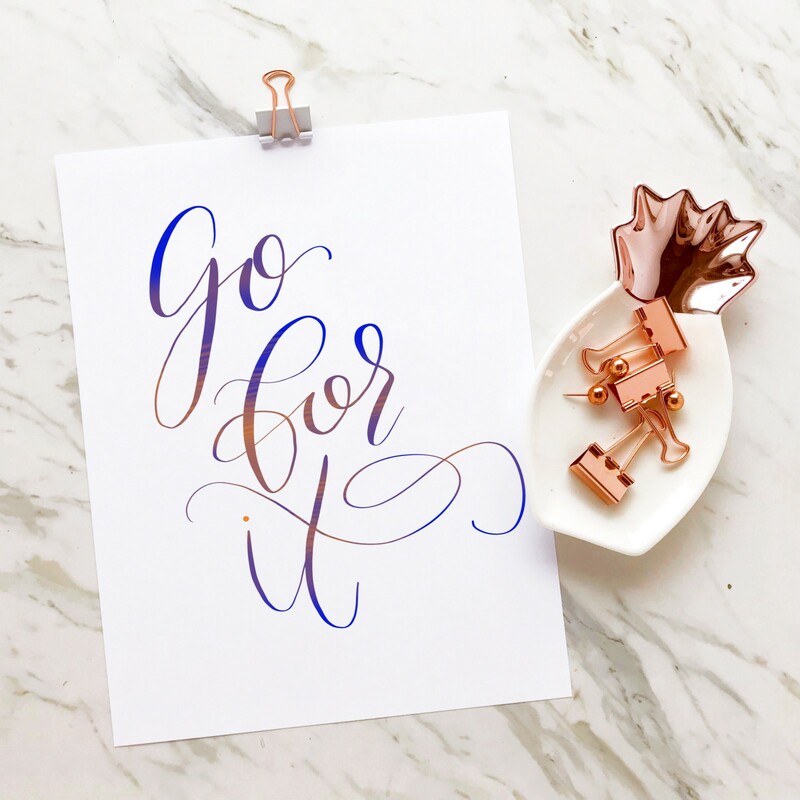 We asked New York-based modern calligrapher, Danielle Rothman, of Rothbyrns Creative, a few questions about her practice and how we can get in on the rule-shattering calligraphy trend for ourselves. 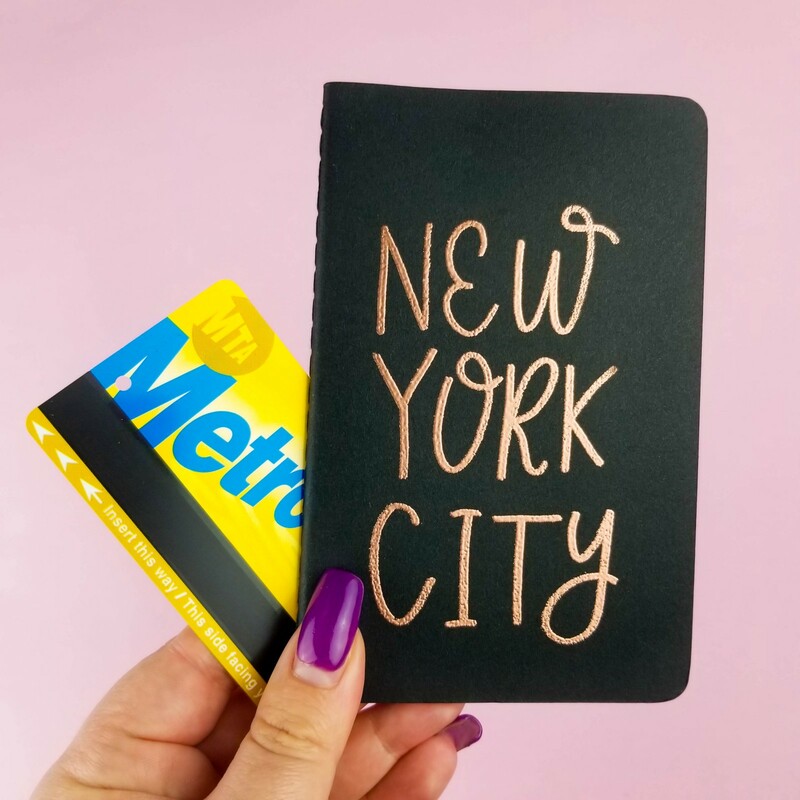 Nooklyn Stories: How did you get into calligraphy? What makes it so rewarding for you? Danielle Rothman: It all started with a coloring book! My friend bought me a coloring book in early 2016 and I became obsessed. Coloring opened up a whole new world of creativity for me. A few months later I bought a set of markers to use with my coloring books and it turns out that they were the gold standard for brush calligraphy at the time. 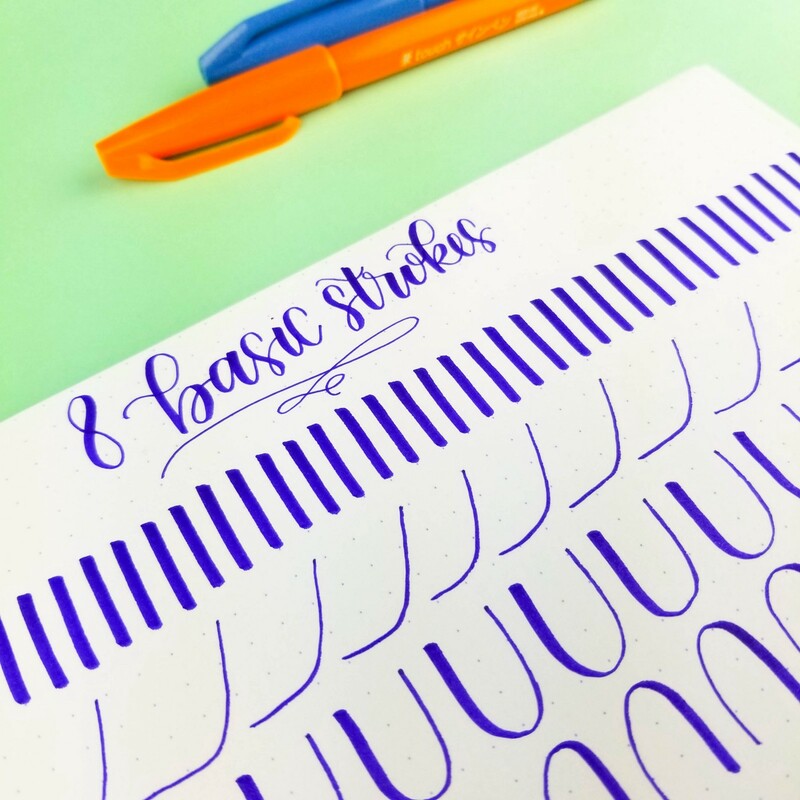 I vividly remember watching my first lettering video and thinking to myself that I have to do that! I find calligraphy rewarding because it combines so many things I love: quotes, books, writing, art, and helping people create thoughtful gifts. The best part for me, though, is the workshops. 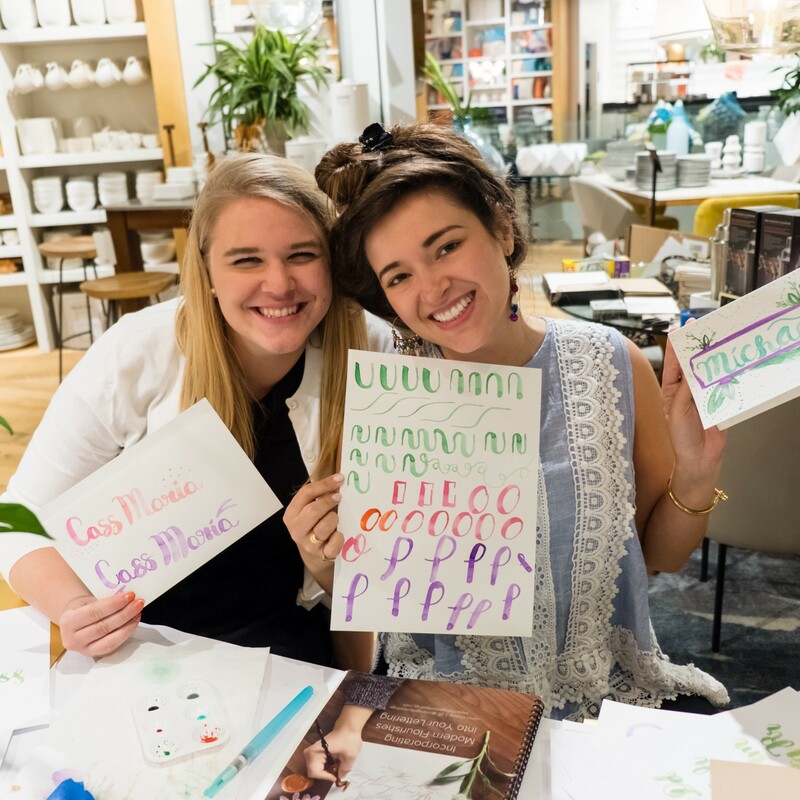 I’ve always loved teaching and being a resource for people — being able to teach calligraphy and help people explore their creativity is incredibly fulfilling! Calligraphy has completely changed my life and career. I went full time with my business Rothbyrns Creative in 2017 and I’ve grown so much since then, both as an entrepreneur and an artist. Through calligraphy I’ve discovered other disciplines like watercolor, embossing, and botanical line drawing. I love how calligraphy touches so many other types of art and I’ve been having a lot of fun exploring! NS: Why modern calligraphy over a more traditional type? Is it personal interest or commercial necessity? DR: I taught myself calligraphy through books and blogs, and in the beginning modern calligraphy was all I was exposed to. It was just starting to become a trend and it felt very accessible. I joined several online communities and found a lot of support there, which made learning both easier and more fun. I’ve always respected traditional calligraphy and I’ve been starting to learn more about it. What I’m discovering is that modern calligraphy is just a different way to approach the same principles. When I started, I didn’t really care about what would sell — it was all about the joy of writing and discovering a new skill. As I developed my business and honed my style, I’ve appreciated the flexibility and fluidity of modern calligraphy. My alphabet has evolved a lot over the last two years, and I’ve started to develop a few different sets to suit both my own and my clients’ needs. NS: What, to you, is the role for or need of calligraphy in a world of digital art practices? DR: That is a very interesting question, especially since most of the calligraphy I have been doing lately is digital! I think there’s always a need for art, and calligraphy (along with visual art in general) is having a well-deserved moment right now. We’re more connected now than ever, which is great, but also has its challenges. Being “on” 24/7 is exhausting, and people are turning to art and calligraphy for stress relief. Calligraphy is a very mindful activity, and even just watching people write it is mesmerizing. With Instagram and YouTube making it so easy to find and follow artists, it makes sense that it’s become a way to relax and reconnect with the outside world. Digital calligraphy is part of that, too. The iPad Pro and Apple Pencil have been a game changer because of pressure sensitivity, and digital art has become incredibly accessible. Calligraphy is at the forefront of this exploration, and there’s a lot you can do with these tools. Personally I love the flexibility of being able to bring my iPad with me on the go, and I’m excited to see how digital art continues to progress. NS: Where can we learn more about calligraphy practices? DR: The best way to learn calligraphy is by taking a class! This will give you a solid foundation in the basics. I’ve taught over 800 students and the number one piece of advice I can give you is to slow down. Writing slowly will give you greater control and neater writing. This isn’t just for beginners, either; most videos you see online have been sped up significantly. Remember, practice makes progress — it’s not going to be perfect when you first start, but the more you practice the better it will be! I always tell my students that it’s better to practice a little everyday than a lot once a month. When I first started, I made gifts for my every special occasion for my friends and family. I enjoyed finding just the right quote for each person and it was helpful to have a deadline to keep me on track. Many of my most popular prints and journals started out as gifts! I’m teaching a special Brush Calligraphy and Embossing class on July 19th at Court Tree Collective in Brooklyn, which you can learn more about on my website at www.rothbyrnscreative.com/workshops. I offer 1:1 lessons, private workshops, and corporate events, and I also teach workshops at CraftJam, Brooklyn Brainery, and Brooklyn Craft Company. You can sign up for my newsletter to receive a monthly update on my classes, as well as free worksheets and printables. If you prefer online classes, I recently published an online class with Skillshare. Use my referral link to receive two months free — there are thousands of great creative classes to choose from! 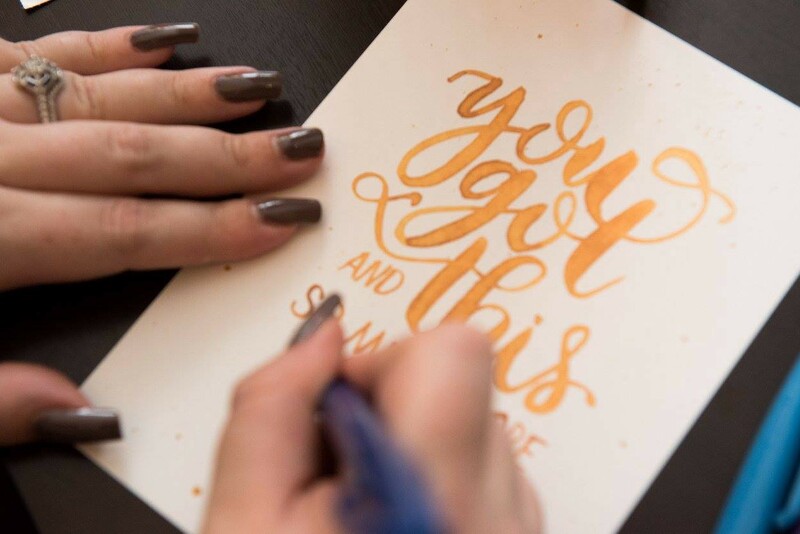 Danielle Rothman is a modern calligrapher who builds community through art and workshops. Danielle has a passion for teaching calligraphy and has helped more than 800 students write beautifully at her workshops in New York City. Her business, Rothbyrns Creative, specializes in personalization and thoughtful gifts, creating inspiring one-of-a-kind journals, prints, and calligraphy designs for any occasion. Recent collaborations include workshops at the Guggenheim and Cooper Hewitt Smithsonian Design Museums, West Elm, Etsy HQ, The National Stationery Show, Eden, Brooklyn Brainery, and CraftJam. Idea woman | Writer | Photographer | Artist • Currently creating in New York, London, and Zurich.